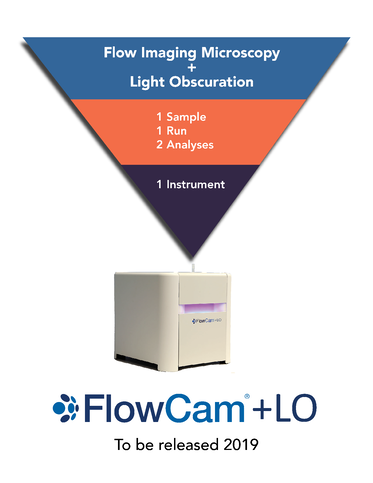 In 2019, Fluid Imaging Technologies will release the FlowCam+LO, a patent-pending flow imaging particle analyzer that simultaneously conducts light obscuration analysis. Light obscuration (LO) is the compendial method for analysis of subvisible particles and proteinaceous particles in therapeutic protein products, required by the US Pharmacopeia, European Pharmacopeia, and Japanese Pharmacopeia. Beyond size and count, other morphological properties of particulate, such as shape, are not yet required. However, these properties may serve as quality and efficacy indicators, and may influence the immunogenicity of the drug. Additionally, particle morphology can change over the course of a drugs life cycle if subjected to stresses such as agitation, temperature changes, or light exposure. The FlowCam+LO will provide LO data in addition to individual particle images and 40+ morphological measurements from the simultaneous FIM analysis. An analysis of a single sample will generate data from each method. The end result — fully-characterized drug particulates, with particle count, size, images, and morphological data captured and recorded from only one sample, one run, and one instrument. For more information, inquire at info@fluidimaging.com or contact us here.